Wow…it’s been forever since I’ve posted anything. A big reason is that I’ve been out of town for the past week visiting family and such. Another is that there just hasn’t been a lot of new stuff going on. While I was vacationing, I did get a fair amount of reading done so I’m hoping I’ll be able to put together a few reviews for your reading pleasure. Plus, I completed the “vomitous first draft” of a horror short story that I hope to polish up a bit and then workshop. 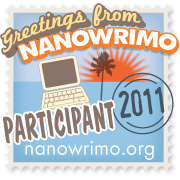 By the way, NaNoWriMo starts tomorrow…which may bring a decided slacking in my bloggery. Of course, even without NaNoWriMo, my blogger-fu has been weak. Oh, I almost forgot…Happy Halloween! This entry was posted in Ramblings and tagged halloween, horror, nanowrimo, weird al yankovic, writing. Bookmark the permalink.